The Highland Museum of Childhood occupies one end of the beautifully restored disused railway station in Strathpeffer. 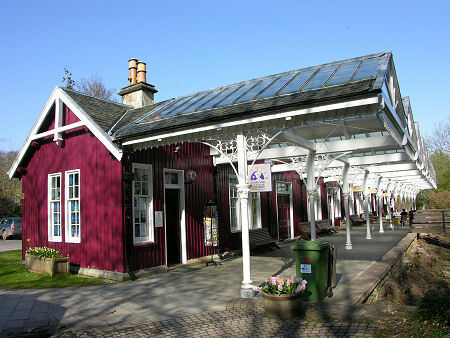 The station was built here in 1885 at the end of a 2½ mile length of line laid from a railway junction on the main line to Kyle of Lochalsh near Dingwall at the height of Strathpeffer's popularity as a spa town. The line closed in 1951, but the beautiful railway station survived, and is now home to the museum, a coffee shop, and a number of other interesting shops. The museum took up residence in what is now known as the Old Station in 1992 and is both an accredited museum and a charity. You enter the museum from the platform side at the village end of the Old Station and are presented with a reception area and a charming shop which itself is full of books and toys for sale, many of the latter having the "I remember those" factor that grabs your attention: and that is even before you have entered the actual museum itself. 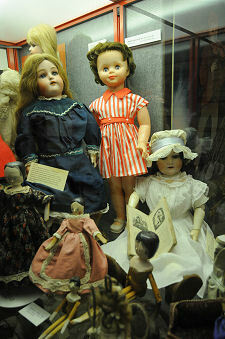 The original core of the material on display at the Highland Museum of Childhood was the doll collection of Angela Kellie, and today a stunning range and variety of dolls remain on display, many grouped in the glass cases in the central part of the museum. But don't make the mistake of regarding this as a "doll museum": there is far more here besides. Beyond the shop you enter an attractive and intriguing area in which informative wall displays are juxtaposed with artefacts and brightly painted murals. Two objects stand out. The beautiful rocking horse on your right was restored by Angela Kellie after spending an indeterminate length of time deteriorating in a summer house. A sign asks visitors not to touch, but in this respect the rocking horse is unusual: far more typical is the dolls house ahead of you, complete with an opening front, furniture, residents, and a standing stool so that really small visitors are also able to see the house and play with it. An area off the the left is exclusively for the smaller end of the size range of potential visitors, who are encouraged to dress up in a collection of costumes and accessories kept in baskets on the floor. The nearby dolls really are worth a second mention. The collection includes Fifi the French fashion doll from 1868, and from the other side of the wheel of fortune, Tissie, a doll which had links to the Highland Clearances. Bringing things slightly more up to date is a set of felt dolls depicting Snow White and the Seven Dwarves and, rather more creeplily, a doll in a Hitler Youth outfit. 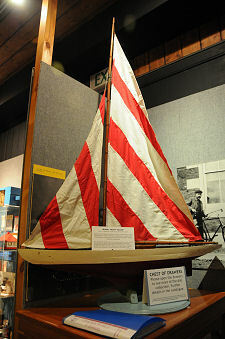 Dominating one side of the museum is the model yacht "Iolaire" (Gaelic for "Eagle") which was made in his spare time by a seaman on a merchant ship crossing the North Atlantic during World War Two. Beneath the yacht is a chest of draws visitors can explore, to reveal more dolls and toys. The title of the museum includes the word "childhood" rather than "toys", and the museum is home to a number of exhibitions bringing to life aspects of social history especially relevant to childhood. The education area at the far corner of the museum is home to a desk complete with satchel and slate, and here you can rediscover an age in which a large portion of the world map was coloured pink; in which Gaelic was banned in Scottish schools; and in which the tawse or strap was a frequently used means of maintaining discipline. The "health and nutrition" displays reveal that the good old days were not always so good: why rotten teeth were commonplace and and why checking children for nits and fumigating schools were a regular part of ordinary life. Another section looks at birth and baptism in the Highlands and includes a beautiful christening gown, as well as a display looking at superstitions surrounding baptism. 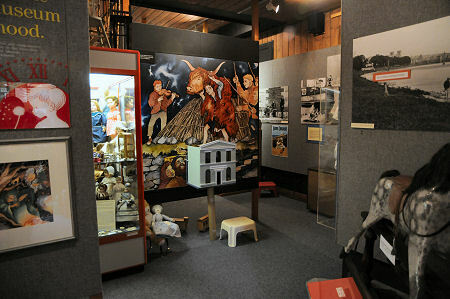 The exhibition in the far end of the museum changes annually. 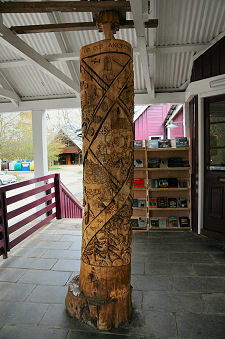 When we visited it was entitled "Tying the Knot: Scottish Marriage Customs" and included a range of artefacts relating to marriage in the Highlands and stories about traditions and individual experiences. Your tour of the museum is rounded off by an audio visual presentation near the education area entitled "A Century of Highland Childhood" and is the result of an oral history project in which local people spoke about their own experiences of childhood. It repeats every 15 minutes. And having spent some time in the museum, what better way is there to round off a visit to the Old Station than refreshments in the associated coffee shop, or a browse through the fascinating stock of Adam Gordon Books.